In the Search Results page, please click on the Page Title (underlined and in blue) to visit the page with the relevant entries. 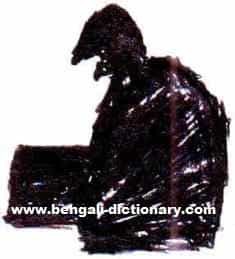 This is a bilingual [English to Bengali (Bangla) and Bengali to English] dictionary of words and phrases with audio pronunciations and illustrations. It is unlike any printed dictionary you have seen and includes many additional features. It is recommended that to profitably use all the features of this dictionary, first time visitors may please read the instructions on the Contents page. There is also a list of pages containing phrases. On your left is a search box to quickly look up a word or even a common phrase. However, this utility can't translate for you just any phrase. Bengali is spoken by 200 million people in Bangladesh, in the state of West Bengal in India as well as elsewhere in India and beyond. It belongs to the Indo-Aryan branch of the Indo-European language family and its immediate ancestors are Sanskrit and Prakrit. Learning Bengali will provide you access to an intensely throbbing life of the teeming millions, knowledge of a rich flora and fauna, plants and animals, many of which may not be found elsewhere in the world, as well as a great literature that dates back to 1000 A.D. and a wide variety of classical and folk art forms, music and drama. The cultural tradition of Bengal derives, in almost equal measure, from the classical Sanskrit literature, later colonial contacts and indigenous folk traditions. For the speakers of English and other European languages, Bengali falls under Category II in terms of difficulty of learning the language as it has significant linguistic and cultural differences for foreign speakers. However, if you have a good guide and some determination, it may not be so difficult to learn. Copyright \A9 2006 by Subhamay Ray. All rights reserved.